The ABA is an adjustable post base which offers moisture protection and finished hardware appearance. 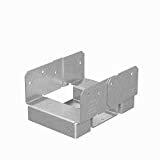 These post bases feature a 1" standoff height above concrete floors, code-required when supporting permanent structures that are exposed to the weather, or water splash, or in basements. They reduce the potential for decay at post and column ends. Post bases do not provide adequate resistance to prevent members from rotating about the base and are not recommended for non top-supported installations (such as fences or unbraced carports). ZMAX galvanized coated steel.